Social determinants of health must be addressed to increase the health and well-being of youth. These broader issues, such as systemic forms of discrimination and access to health care, create health inequities and poor health outcomes among young people. Our services are designed to provide agencies, coalitions, and systems of care with the knowledge, skills and tools they need to implement structural-level changes, build cultural competency, and mobilize communities. Supports communities to organize and strategize around how to address social determinants of health that create inequities among youth. Communicates emerging research and best practices via webinars and other resources. Builds upon over 50 years of expertise serving youth in the Division of Adolescent and Young Adult Medicine at Children's Hospital Los Angeles in partnership with communities. Services include trainings, technical consultations, webinars and tools. You can request further information and/or services from SYPP Center by contacting Arlene Schneir, MPH. 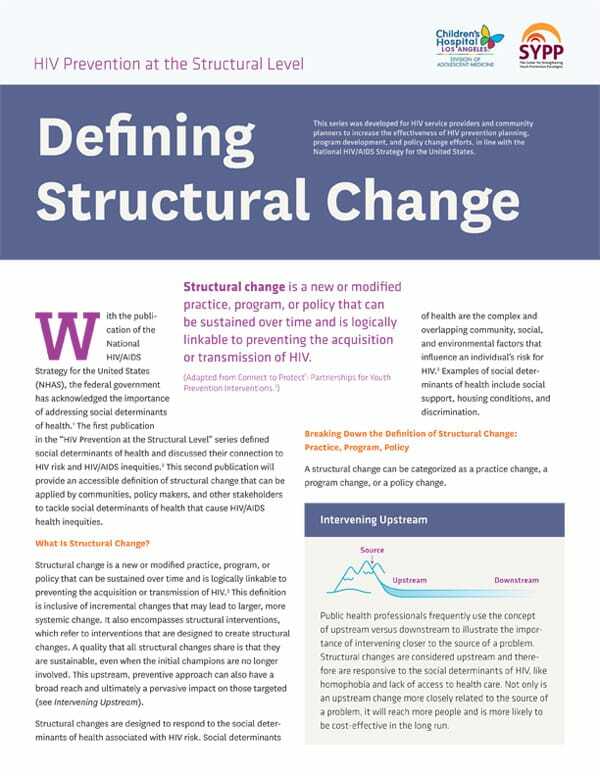 This research to practice brief discusses structural change as an approach to HIV prevention and provides solutions for agencies to improve linkage to care. This resource is designed to help HIV service providers and community planners better understand how structural change can tackle the social determinants of health that cause HIV/AIDS health inequities.